I recently took the big step of publishing a photo book last year. Somehow I got the book into various bookstores in my community and have nearly sold all of them out. By no means am I an expert photo book maker, but I learned a lot about the process that I'd like to share with you. This series of articles will go over the three biggest steps I had in publishing a book: why I wanted to do it, how I designed it and how I printed and sold it. I wanted to make a photo book for two reasons. I wanted something physical that could be the culmination of images I was making for the tattoo project and secondly I wanted to see if it was possible. In the beginning there wasn't the faintest thought of making money or any idea of how to sell it. 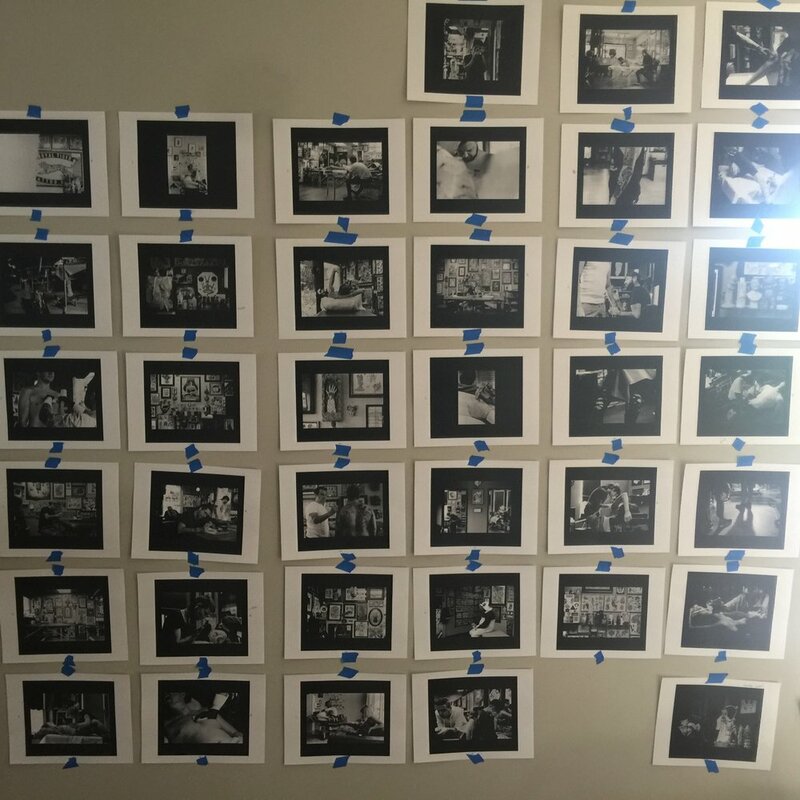 It was just trying to get enough images to make a book and then designing and printing it. Every year for ten years. I have been making books since college. For ten years I would compile a Top Ten recap book/zine/journal of the previous year. A group of four to ten friends would send me their top ten lists and I would design and print it. It was a fun little project and I enjoyed the process of collating, editing and designing these yearly snapshots. For the past three years since moving to Austin, I have been buying and studying photo books. Austin has a great library system and was able to quickly pick up many seminal photo books: Walker Evan's American Photographs, Robert Frank's The Americans, Stephen Shore's Uncommon Places and William Klein's New York 1954. They were all classic photo books that would give inspiration for what a great book could be. The first part of making a photo book was the most enjoyable, taking the images. I shot as many tattoo shops as I could go to and spent a lot of time hanging around shops. I learned more about the tattoo community and a lot more about being a working artist. The more I was able to learn the more I was able to get deeper into the craft and profession, which helped open doors. I also played a lot of little games when I shot. I had a running shot list in my head: people tattooing, flash, walls, desks and decoration. I wanted to capture the feel of a shop in two or three images. Each time I'd try and do something I hadn't tried before: seeing how close I could get, how much I could push my film, different lenses and etc.. Anything to get more variety on the images. The most important thing I learned was how to enter a situation and get everyone at ease and slowly work your way into more intimate shots. I couldn't just walk up to someone I didn't know and get a shot of them tattooing at arms length right off the bat. I would need to make them ok with the fact that I was taking images and not getting in the way and that I wasn't a creep with a camera. You need to constantly read the room and be at ease that you're in a person's working space with a camera. After about two years, I had close to 900 images and felt it was time to start putting something together. I was still visiting shops and getting photos but I felt that I had enough variety and quality of shots to get to another point in the project. So I then started to design the book. I wanted to make a photo book with all the photos from the tattoo shops in 2017. It was one of my resolutions from the beginning of the year and I didn't seriously consider it until I saw a tweet from Ade Torrent about a Blurb holiday sale on books.